Crowds gather to watch the inauguration of President Barack Obama on Jan. 20, 2009, on the west side of the Capitol in Washington. So many events, so many sights, so many experiences, have stayed with me over my 45 years as a reporter. But none so much as what I saw as the mid-day sun hung over the U.S. Capitol on an extremely cold January morning in Washington, D.C. It was January 20, 2009, when, at high noon, Barack Obama – the then-47-year-old son of a Kenyan father and a Kansas mother – took over the burden of becoming the 44th president of the United States. The time was as challenging as any that had faced his predecessors, with the country at war and the economy in a tailspin. He was not the first president – nor will he be the last – to take office at a time of crisis and uncertainty. When Obama stood on the west front of the Capitol to repeat the 35 simple words of the presidential oath, he was standing at the same place where, in March 1861, Abraham Lincoln pleaded for peace as the union was falling apart and hurtling toward a bloody civil war; and where, in 1933, Franklin D. Roosevelt lifted the spirits of a people ground down by the Great Depression, giving them hope for better days to come. But on that day Obama was sworn in, there was nothing but joy – unbridled, unrestrained joy – in the faces and hearts of the estimated 1.8 million Americans who had come from every corner of their country to the nation's capital to witness – and to celebrate – the swearing-in of the first African-American president. 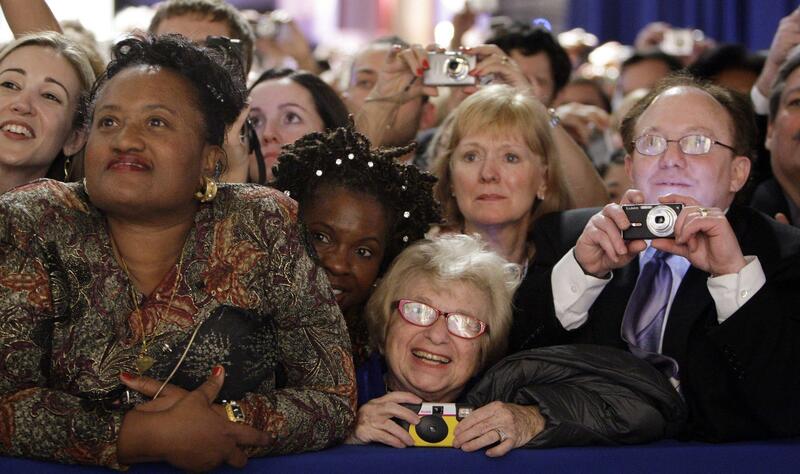 People - including Dr. Ruth Westheimer, center - watch President Barack Obama and first lady Michelle Obama at the Western Inaugural Ball in Washington on Jan. 20, 2009. I had been there in Washington for several days before the Tuesday inauguration and had watched the crowds and the excitement build on the streets of Washington, where the nation's history had played itself out for over 200 years. The morning after the election, I told my editors that if they wanted me to cover the inauguration, they had better start looking for a place for me to stay. I knew full well this would draw an inaugural crowd like no other. I was right. Within about a week, Robin Buchanan, the news aide who helped reporters and editors with travel arrangements, came back with the bad news – there was not a single hotel or even motel room available inside the Beltway or in suburban northern Virginia and Maryland. I knew that, as a reporter for a Gannett paper, I'd be working out of the Gannett News Service/USA Today offices on New York Avenue, a few blocks from the White House. We put out a plea to the Gannett News Service reporters and editors to see if they had a spare room. One of the reporters at Gannett News Service offered me her apartment in the Adams Morgan neighborhood, one of the city's trendiest addresses. She said she would move in with her boyfriend for a few days if the Enquirer would pay for use of her apartment. Adams Morgan was quite a distance from the action, and during inauguration week, the underground Metro system, one of the best subway systems anywhere, was overloaded, with huge lines of people trying to get on at every stop. I decided that I would make better time if I walked. I trekked back and forth each day between Adams Morgan and New York Avenue or the National Mall – quite a distance. It was a small price to pay to be there to cover this story. I had covered inaugurations for the Cincinnati Enquirer before – both of Bill Clinton's inaugurations; the second inauguration of George W. Bush (I had missed Bush's first, because my niece was getting married back in Ohio that day). Nothing, though, compared to what I saw in my four days in Washington in January 2009, and especially on the National Mall on the morning of Jan. 20. Crowds stand on and near a statue on the National Mall ahead of the inauguration of Barack Obama as the 44th President of the United States of America. To me, it had been another presidential election to cover, albeit one that had historical implications – two senators, the Democrat Obama, a relative newcomer to national politics, facing a Republican senator in John McCain, who had lived a life of service and sacrifice to his country as a prisoner of war, a man who could not even put on his own suit jacket because his North Vietnamese captors had broken his limbs years before. But the historic nature of Obama's election first struck me a night five months before when, in a professional football stadium in Denver, he accepted his party's nomination before a full house of ecstatic Democrats. It was on that night the full weight of the historic nature of the 2008 presidential election hit me right between the eyes. And then, there was that morning of the inauguration. There, I saw sights that will stay in my memory forever - as vivid today as they were 10 years ago. I had a press ticket up near the front, close enough to the temporary stage on the west steps of the Capitol that I could look directly up at Barack and Michelle Obama and their daughters walking down the steps; where I could see the soon-to-be former president, George W. Bush, ready to hand over the reins of government; and the other ex-presidents, vice presidents and the current leadership of Congress. I could stand up and hoist myself onto a riser for TV and still photographers and take a look backwards at the crowd, which stretched for nearly two miles on the National Mall. And it struck me that the soon-to-be new president could see exactly what I could see. 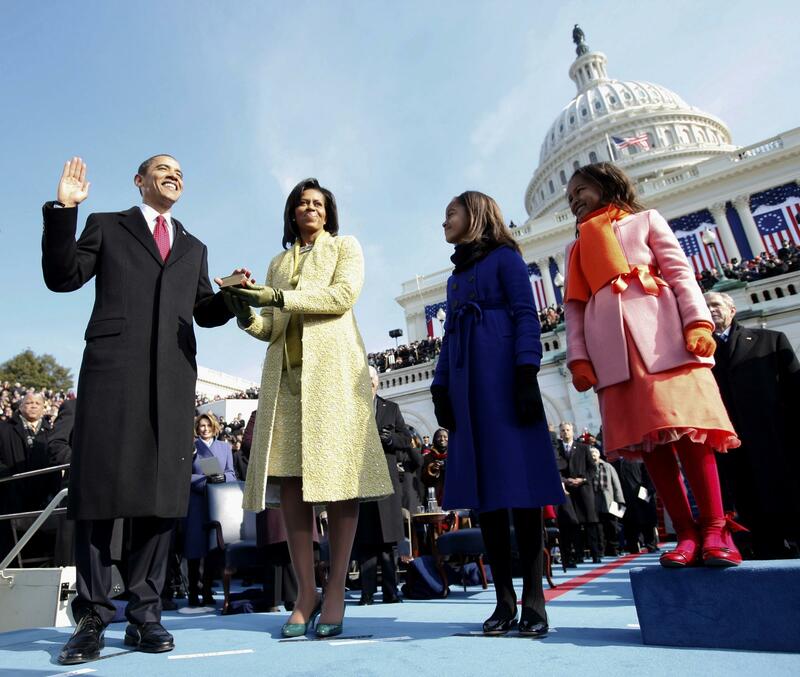 Barack Obama takes the oath of office from Chief Justice John Roberts, not pictured, as his wife Michelle holds the Lincoln Bible and daughters Sasha, right and Malia, watch at the U.S. Capitol in Washington. I think Lincoln would have approved, as would a black preacher who would stand on the steps of the Lincoln Memorial before a crowd of a quarter of a million people in August 1963 and tell of his dream of a day when we would all be judged not by the color of our skin but the content of our character. I remember standing there, shaking like a leaf – not from the single-digit January cold, but from the enormity of it all. On Inauguration Day and in the days leading up to it, I spoke to hundreds of people, many of them from Cincinnati and northern Kentucky, who had come in automobiles, airplanes, trains and buses to be there for this event. One of my favorite groups was organized by Cincinnati's Lincoln Heights Missionary Baptist Church, which gathered up church buses and signed up about 500 people to ride to D.C. They really had no clear idea of where they would stay; they seemed to be hoping to depend on African-American churches in Washington to put them up. The Enquirer sent one of its good young reporters, Jessica Brown, to travel with them. In the end, they ended up staying in the National Museum of the American Indian, just off the National Mall. And, although they were so far away from the Capitol they had to depend on the many giant-screened TVs set up on the mall to watch the proceedings, they were just happy to be there. For Lois Cunningham, an 81-year-old woman from Mount Healthy who traveled on one of the Lincoln Heights Missionary Baptist buses, seeing Obama become president meant that, at long last, she lived in a place where anyone can accomplish anything regardless of race. "Whatever you are, whatever you want, you can do it if you try hard enough,'' Cunningham said. Sonnie Rembert, then 62, of Hamilton, was there as well. She saw the day as Martin Luther King Jr.'s dream coming full circle. "Martin Luther King preached it and Obama took the scepter and ran with it,'' Rembert said. "He brought the nationalities together. I want to say I was there and to encourage my grandchildren so they can encourage their grandchildren about the importance of voting and the importance of loving each other, no matter what color we are." Steve Van Enman of Clermont County's Pierce Township was one of the millions of volunteers who worked for the Obama campaign. So, too, was his wife, Mary Lou. Their daughter, Julie, was a paid staff member for the Obama campaign in Philadelphia. After the election, she went to work for the inaugural committee in Washington. At the last moment, Julie was able to find seated tickets for her parents and twin sister Lori on the Capitol Platform, only about 50 feet away from where Obama delivered his inaugural address. 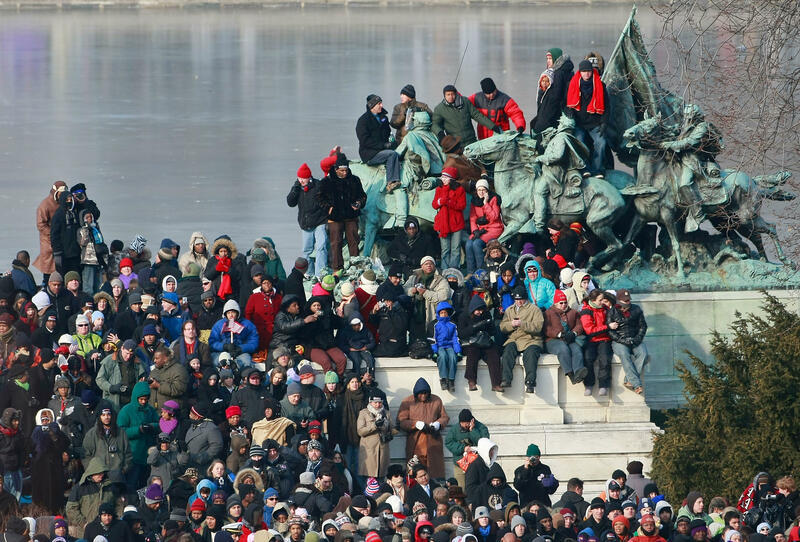 "It was stunning to look out across the Mall, with people as far as the eye could see,'' Steve Van Enman said. "The applause would start in the front and work its way back; and it looked like fields of grain waving in the wind,'' he said. "The most amazing sight I have ever seen." Cathi Alexander, a fifth grade teacher at Midway School in Westwood, watched from a ticketed area not far away. "It was amazing - watching all the thousands of little children, braving the cold, looking so hopeful,'' she said. "And all the elderly people in the crowd, with faces full of joy. "I cried. Oh yes, I cried." You were not alone, Cathi. There were millions of tears of joy shed that day on our National Mall.